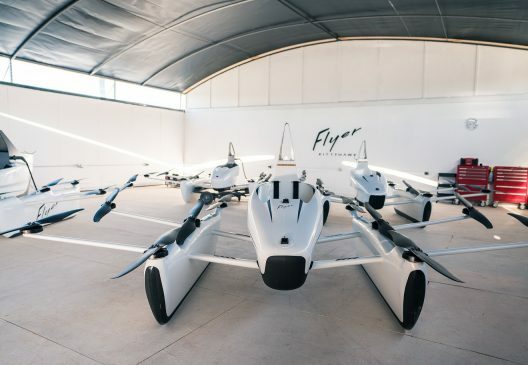 Kitty Hawk Flyer, the Larry Page-backed “sky taxi,” seems like a great summer escape machine. One can learn to fly it in about an hour, but it will remain low and slow enough to give the thrill of flight without inordinate dangers. That’s the marketing pitch from Kitty Hawk, and it’s not a bad one. Imagine going to a beach or lake with dozens of these fluttering about over the water’s surface. It’s the same kind of lure driving go-karts on a miniature race course has for vacationers. CNN’s Rachel Crane traveled to a secret lake-side enclave in the desert near Las Vegas to train in and float in the Flyer. Colleague Matt McFarland watched, interviewed Kitty Hawk CEO Sebastian Thrun, and made the seemingly inescapable link to the Jetsons. One troubling aspect was the dunking practice. “The hardest part of the day was definitely the ball pit,’ recalled Rachel. “During her training session, she was strapped into Flyer and turned upside down in a ball pit. The drill is a way to practice unbuckling one’s seat belt and escaping Flyer if it were to crash upside down on water.” That possibility might give potential flyers pause. 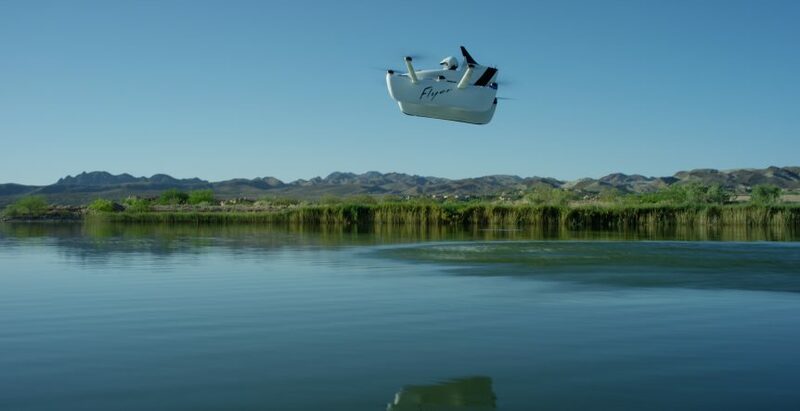 Kitty Hawk’s website offers a light once-over on technical aspects of the design, letting us know the craft’s “All-electric motors [are] powered by lithium polymer batteries,” and “Innovative software… utilizes data from multiple sensors to make flying intuitive and easy.” The “Revolutionary Design [is] expertly crafted using highly durable composite material that is lightweight, aerodynamic and waterproof.” The last point is necessary because the Flyer will only be authorized, like its first iteration, for operation over water. This version, looking like an open kayak with outriggers, will do well on water, large open bodies of which provide safe places to practice one’s skills. Kitty Hawk will be “Significantly quieter than any fossil fuel based equivalent” – whatever that might be. Rachel Crane’s flight was software-limited to six mph and a lake-skimming altitude. As Flyers achieve more hours in the air, these limits will expand to enable commuter-like flights at altitudes where they might interfere with Amazon and Dominos’ deliveries. Everything is FAR Part 103, avoiding licenses, medicals and other impediments to personal flight. Todd Reichert leads the engineering effort. He and his team from Aerovelo built and flew the first human-powered ornithopter, won the Sikorsky Prize for human-powered helicopters, designed, built and ran Eta, the fastest human-powered vehicle on earth (89.59 mph). This is an aerodynamic achievement as well as an athletic one, and is a huge contrast to the Flyer. Kitty Hawk offers several opportunities to partner with the firm. One might want to operate a fleet of flyers, or stage an event involving several craft. One might decide to purchase a Flyer (price unknown yet) for personal use. These options require you to fill out an application and await an invitation from the firm. One can connect with the company and receive current news updates, and for those with the necessary skills, join the Kitty Hawk team.